Open hardware news from near and far. We talk with Alex Klein about Kano Ð a computer anyone can make. The HummingBoard with its quad-core power, larger storage space, and faster interfaces is a strong competitor for the RaspberryPi. Use Pydio to transform Raspberry Pi into a powerful file sharing and collaboration tool. The human eye cannot see into the infrared range, but a Rasp Pi can if you outfit it with the NoIR infrared camera module. Enjoy a crash course on some Linux text tools. When the Rasp Pi GPIO isn't enough, use the I2C data bus to communicate with sensors. Improve reliability for your automated system with a watchdog timer. Interface this cool robot toy with Arduino. Will this innovative Pi case solve your cabling problems? Tips for configuring your XBMC media center. 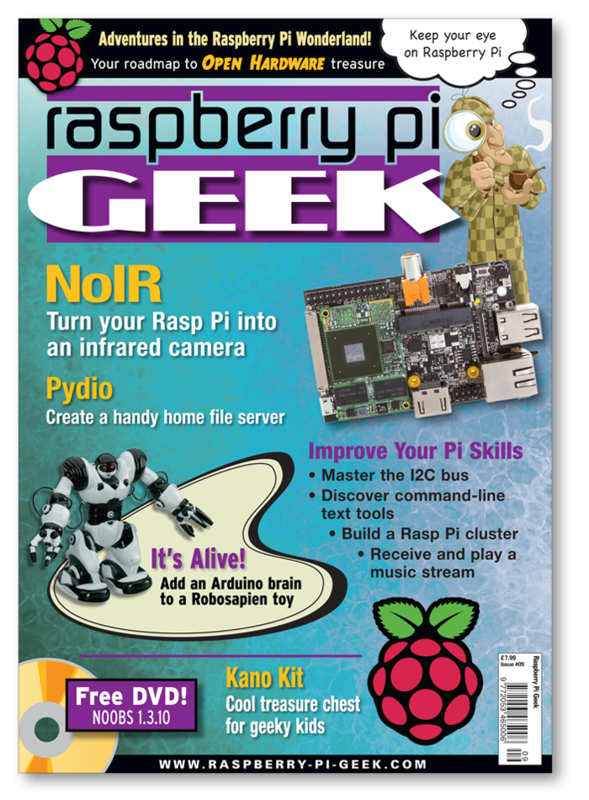 Build a cluster with several Rasp Pis and a low-cost root server. Receive an iPhone music stream with your Rasp Pi. Build a secret message encoder with Morse code.